Rogue Racing set out to make a lasting impression by creating the most sought after suspension upgrades for the 2010-2014 Ford Raptor that were able to still be daily driven while dominating the trails. Fast forward 3 years and the release of the 2015 Ford F-150, a great platform for improvements but 1 minor detail was missing..."Raptor". Ford left everyone including potential and current Ford Raptor owners in limbo waiting to know if the program was dead or was there something in the works? Rogue Racing stepped in and created 2 amazing suspension conversion kits to satisfy every ones desire for off road performance, mean looks and fill the void Ford created. We are proud to announce our latest offering for the 2015 Ford F-150 4WD & 2016 Ford F150 4WD. Stage 16 Suspension system, a perfect compliment to our subtle "Raptor" conversion (Stage 12) and our extreme performance (Stage 18). Taking the best of both worlds and making a middle of the road conversion that puts you ahead of the curve on and off road. We manufacture all of our Polaris RZR long travel systems with 3 points in mind. Performance, Durabilty & Saftey. Not all long travel systems are built with the off road experience background Rogue Racing has. PERFORMANCE: Our products for the Ford Raptor and Chevy Silverado 1500 have proven themselves time and time again, we have taken those same innovations and implemented into our UTV line! DURABILITY: Made In The U.S.A. with all American Made material & components: Platework (4130 Chromoly), Tubing (4130 Chromoly), Spherical Bearings (FK), Heims (FK), Machined Parts (7075 Aluminum). Bearings, Rod Ends & Bushings are fully rebuild-able! SAFETY: Everything is tested, torn down and inspected before putting our stamp of approval for final production. Ensuring our products will not fail in the environment that they are designed to be used in. 1 Piece 4130 Chromoly - Primarily 1/8"
As Shown: 57" From Ground To Top Of Cage. Has 32" Tall Paddle Tires. 6'2" Tall Driver With Seat Lowered 2". Designed from the ground up, we started with a bone stock Can-Am Maverick X3. Laser scanned the whole car into Solid Works for an working 3D model with precise measurements. We determined the factory roll cage may look alright, it definitely has weak points. Can-Am Maverick X3 Roll Cage Specs: 1 7/8" 0.065" Wall Tube, Welded on. Rogue Racing Low Profile Roll Cage Specs: 2" 0.120" Wall Tube, Bolt On w/ Grade 8 Hardware. Bolt On Rear Bumper, Custom Powdercoat Colors and More! We are selling our awe inspiring Chevy Silverado 1500 AKA "The Dominator" featuring all of the goodies in our "Dominator" suspension system. Rogue Racing is proud to introduce the new VELOCITY front bumper for the 2010-2014 Ford SVT Raptor. We have taken some style and design from the RENEGADE front bumper, modified and re-enforced the skid plate and came up with this budget friendly, easy install and stunning front bumper replacement. Clean lines as well as functionality is what Rogue Racing has designed all of our bumpers around. Upper tube radius follows the valance on the Ford Raptor and pairs nicely with a Baja Designs OnX6 ARC 40" Curved LED light bar. Our new skid plate design gives you the approach angle and strength you would expect from Rogue Racing. Integrated side tabs to hold your cornering or accent lights with multiple mounting locations. Works well with many single row LED lights or cube LED lights, options are endless. The VELOCITY front bumper comes standard with tabs to mount a 40" curved LED light bar. View The Product Page & ORDER Yours Today! Thats right folks, the 2017 Ford Raptor will have a new 10 speed transmission connected the EcoBoost power plant. The 10 speed transmission is the first of Ford's transmissions to use cast iron components allowing the transmission to further decrease the overall weight of the truck. To add to the weight loss Ford uses an integrated torque converter/turbine clutch. Ford wants everyone to know that the new transmission built in conjunction with General Motors is Ford built. Ford says the new 10-speed will improve both acceleration and performance compared to its previous six-speed automatic transmissions. The 10 speed transmission uses wide-span gear spacing and “drag-reduction actions”, while three overdrive gears and a wider span overall that enables lower-numerical rear-axle ratios to help improve fuel efficiency. This transmission is filled with technology such as “Smarter shift logic” and “All-new adaptive shift-scheduling algorithms that monitor more than a dozen powertrain and driver control signals in real time – ensuring the right gear at the right time for an engaging driving experience, including in sport mode.” The company also notes it will employ an integrated electric pump to work with the standard Auto Start-Stop system to improve over the previous system. Added for driver confidence will also be what is known as "Launch countdown" which allows the driver to know exactly what gear he or she is in. Ford states that the company is investing $1.4 billion into its Livonia Transmission Plant that will retain and create 500 hourly jobs to assist with the new transmission. Rogue Racing a leader and innovator within the truck and off-road community is excited to announce the start of design and manufacturing of products for the 2017 Ford F-150 SVT Raptor. Since the release of the first generation Ford Raptor the world has watched as companies have strived to build bigger and better products to improve upon an already excellent platform. Rogue Racing an innovator within the community has set itself apart with products that include innovative Front Bumpers, Rear Bumpers, and Suspension Components. Products within these categories includes five front bumper styles, two rear bumper styles, and suspension that includes the first ever bolt-on cantilever kit for a full size production truck. New products for the 2017 Ford Raptor from Rogue Racing will include all of the current offerings plus an innovative front suspension kit that will increase the front suspension travel numbers significantly without having to widen the track width. Other products for the 2017 Ford Raptor will include a new never seen before Front Bumper, Rear Bumper, a new Cantilever Kit and some other products that will fit right into Rogue Racing's current product offerings. Stay tuned for more information or feel free to call us at anytime at 702-586-8050 or email us at info@rogueracing.com. The Ford F-150 Raptor needs no introduction in the truck enthusiast community. Since the debut of the first-generation model in 2010, the Raptor has been synonymous with the ultimate in factory off-road performance. In developing the second-generation model, Ford knew it had some big shoes to fill. By all indications, the second-generation truck will top the original in almost every category. Speaking of shoes, Ford was sure not to neglect one of the most critical performance items on an off-road truck: its tires. Working in collaboration with BFGoodrich engineers, Ford selected the T/A K02 all-terrain tire for the new Raptor. This specific fitment features an optimized tread pattern, greater tread area than the tires on the first-generation Raptor, larger sidewall lugs, and steel and nylon belts to improve compliance and comfort on-road. Ford knows we’re suckers for action footage of trucks romping around in the sand or mud and naturally obliged us with this minute-long clip. We know the new Raptor will be the lightest, most powerful, and most capable yet. The traditionalists may bemoan the transition from large-displacement, naturally aspirated V-8 power to turbocharged, EcoBoost V-6 power. However, we expect the boosted six to deliver performance in spades. We can’t wait to get our hands on Ford’s new off-road hero. Starting next year, Ford will sell a redesigned version of the Raptor pickup in China, the company announced Friday. It will become the first version of Ford's full-sized truck-- the most popular passenger vehicle in the United States -- to be available in China. 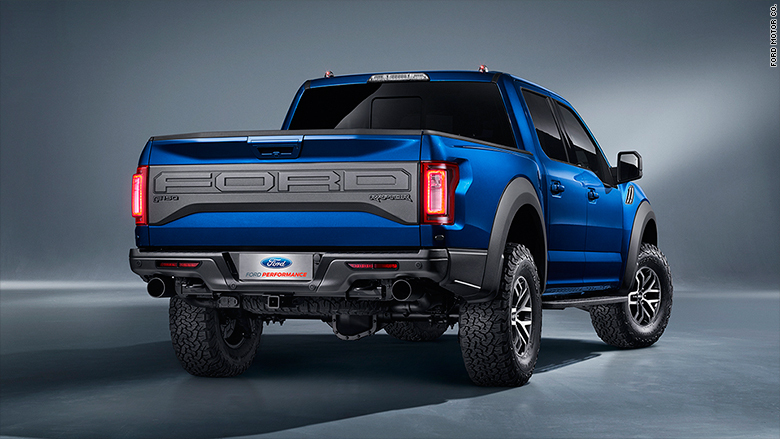 The new Raptor is powered by a turbocharged 3.5-liter V6 engine that produces more than 411 horsepower. It is a high-performance version of the F-150 pickup. It's modeled after desert racing trucks. "By introducing it to the world's largest auto market, we hope to inspire a new generation of off-road enthusiasts, and demonstrate how we are always bringing our customers new innovations," John Lawler, chairman and CEO, Ford Motor China said in a statement. The all-wheel-drive Raptor will have a 10-speed automatic transmission that was developed jointly by Ford and General Motors. It will have various "driving modes" -- including high- and low-speed off-road, high-performance street-driving, and "normal" for everyday use. Rogue Racing is proud to release the 2015+ Stage 12 Conversion Kit to the public. This kit allows anyone with a 2015 and newer Ford F-150 to convert their truck to have Raptor Looks and better than Raptor Performance with stronger components. This kit features full front suspension, rear suspension, body panels, and bumpers. Visit STAGE 12 for more details and specs on the kit.